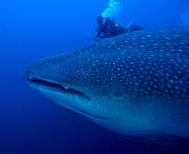 The whale shark is the largest fish in the world reaching up to 20 m (60 feet), frequently. Its name and huge size cause people to confuse them with whales. Unlike whales, who breath oxygen from the air, whales sharks obtain oxygen through their gills, just like fish and other sharks. What makes whale sharks different from other sharks is that whale sharks do not eat meat, but consume tiny animals floating in the sea, called plankton, in feeding habit, they are similar to most of the largest whales, catching this tiny floating plankton by opening their mouths and letting in large amounts of seawater and passing in through a filtering structure located on their gills. Whale Sharks meet in large numbers in Bahia de la Paz, giving people from all over the world an opportunity to experience one of the most exciting encounters between people and nature. Ecotourists can get relatively close to these giants and enjoy a memorable experience providing they adhere to certain rules. Reserve now and plan your adventure!